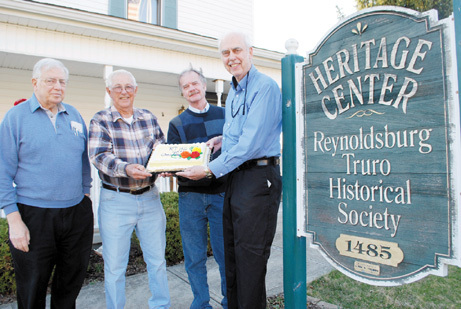 The Reynoldsburg Truro Historical Society kicked off its 40th anniversary with a celebration of the milestone during a March 31 meeting. Sharing a slice of the anniversary cake are, left to right, Richard Barrett, vice president; Richard Barth, a member of nearly two decades; Steve McLoughlin, president of the Whitehall Historical Society and Reynoldsburg Truro Historical Society President Mark Myers. 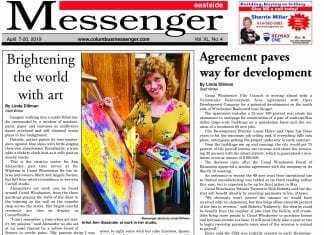 The Reynoldsburg-Truro Historical Society hits a milestone this year in celebrating the 40th anniversary of its organization by Graham Road Elementary teacher Audrey Hammond. The first general meeting, held at the school in September 1975, attracted 209 charter members. Membership soared to over 300 within one year. Meetings were also held in other schools, private homes, Don’s Briarcliff Restaurant, and the Main Street fire station. In 1976, Ralph Connell offered the upper floor of his hardware store to the society for $1 per year, but it was not opened to the public until a year later. It remained the society’s museum for the next 30 years. An 1850s era house that previously stood at the intersection of State Route 256/Graham Road/Livingston Avenue was donated to the society to serve as a new home for the museum. It was moved to its present site, 1485 Jackson St., in the fall of 1993 and became the Heritage House Museum. The house, a large storage/display barn and the Bennett Garage display/storage building are filled with artifacts related to Reynoldsburg’s history and open to the public the third Saturday of every month from 10 a.m. to 2 p.m., except for August and December. Admission is free and outdoor displays are visible all-day, every day. Five bay windows on the west side of the barn light up automatically including a summer kitchen, National Road display, barn stable, blacksmith shop, and recreation of Connell’s Hardware. The former Bennett’s Garage windows also light up with the push of a button. “They are spectacular at night,” said Myers. Most of the items on display and in storage are donated to the society. Members also monitor auction sources like eBay for Reynoldsburg-related artifacts. An active core group reviews the inventory on a regular basis in deciding what goes on display. Historical resources in the society’s research center on the lower level of the museum are available to individuals working on genealogical and academic research during monthly open houses and by appointment. Historical articles are also available on the organization’s website at www.rths.info. Myers feels the most historical item in the collection is an original letter written by James Reynolds, the city’s namesake, in 1846 and the strangest is possibly an undertaker’s satchel, filled with the “oils” of his profession, from the early 1900s. The society is self-funded and not subsidized by any public entity. Its major source of operating revenue is derived from membership dues, fundraising events, and donations/ bequests. Acquisition of artifacts is a continual process for the society. Myers said the group is in need of historical pictures and artifacts of old Reynoldsburg, in addition to city newspapers from the 1990s. As for the organization’s greatest challenges? People and publicity. For information on membership, donations or contributing to the society’s collection, visit www.rths.info or call Myers at (614) 868-5354. Membership forms are also available at the museum.